“Prior to launching our website, we operated in relative obscurity. The public really had no idea what we did or what was really going on in their communities. Now they do, and they love it. They are more involved and active in providing tips, solving crimes, and capturing wanted persons. Imagine having a surveillance photo of a burglary suspect, and in a matter of minutes having 23,000 people see it and identify the suspect. Well, you don’t have to imagine it because it really happens. When we launched the site in 2014, the first full month in June we had 20,173 unique visitors and 405,000 page hits. This past month of June 2016 saw 27,342 unique visitors and 5.4 million page hits. THAT is a lot of PR. Media relations are also enhanced. Before, if we wanted to get something out to the public, we would send a release to the media. Maybe they would run it, maybe they wouldn’t. Maybe they would edit it. Now, we control the message, the content, the intent, the when; total control. Media likes it because it makes their job easier. Now they just have to plagiarize. They have the ability to copy scene photos we may post that they would otherwise not get. Again, the public loves this. But what the public likes the most, and what has been the most popular feature of our site, is the jail roster. I don’t think a day goes by that I don’t hear somebody out there mention it. I like to think of it as a crime deterrent as well, because people don’t want to “end up on the roster.” I can’t prove the correlation, but our burglaries YTD are down compared to 2014 by 52%, and down 64% compared to the same period last year. The roster also saves on phone calls/inquires to the jail, as all the info is online: who, charges, bail, when released, etc. Bottom line, our results have been spectacular. Just last week, we had a vulnerable adult go missing from his residence in a very isolated, wooded area of our county. We were about to call out search and rescue resources and aircraft because by then he had been gone for over six hours. I used the Special Alert feature on our site asking for the public’s help in locating the man. Within minutes we were notified that somebody had picked him up on the highway earlier in the morning and drove him to the Duluth Goodwill, where he still was. What a time and resource saver that was. Here’s my commercial: In this day and age, you cannot not do something like this. The public expects it, they love it, and the results speak for themselves. Angie and the entire team at Brooks-Jeffrey Marketing has been a breeze to work with and will walk you through the entire process from start to finish. 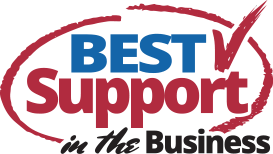 Support is an email or phone call away. Based on my experience with them, I am comfortable recommending them to you. I went into it thinking it (website) would be a cool thing to have. I couldn’t have envisioned the results we have achieved."